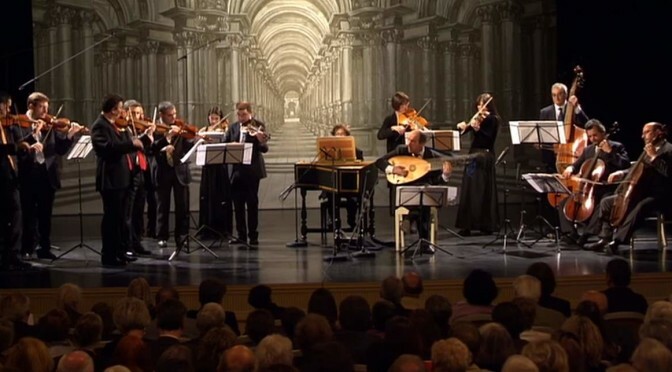 Conducted by Luca Meles, the Venice Baroque Orchestra performs Antonio Vivaldi’s Symphony in G Major for Strings and Basso Continuo, RV 146 at the Schwetzingen Festival, 2010. From the concert given in the Rococo Theatre, Schwetzingen Castle, Baden-Wuerttemberg, Germany on May 16, 2010. Conducted by Andrea Marcon, the Venice Baroque Orchestra performs Antonio Vivaldi’s Juditha triumphans devicta Holofernis barbarie (Judith triumphant over the barbarians of Holofernes), RV 644, an oratorio which the only survivor of the four that he is known to have composed. French countertenor Philippe Jaroussky sings “Alto Giove”, Acis’s aria from Nicola Porpora’s “Polifemo”, an opera seria in three-acts. Venice Baroque Orchestra conducted by Andrea Marcon, at The Royal Opera of Versailles, 2012, Broadcast by Mezzo TV.